During our 4 bathroom renovations (I forgot about shower renovation we've done our townhouse last year) we have searched high and low for different tiles keeping costs in mind. 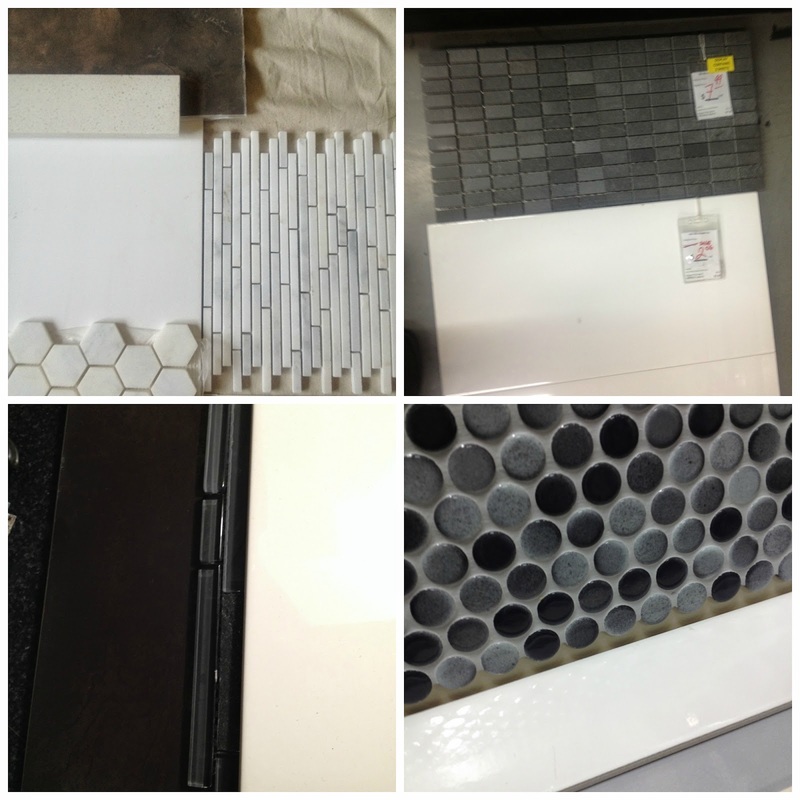 For our renovations we have purchased floor tiles for master bathroom (at $2.5/sq ft), decorative mosaic strip for master shower (at $14/sq ft), marble mosaic strip for kids' vanity back splash (at $11/sq ft), 4x16 white subway tile for basement bathroom shower (at about $2/sq ft), stainless steel penny round tile for shower strip (at $16/sq ft), green glass mosaic strip for kids shower (at about $7/sq ft), stone and glass mosaic strip for basement bar back splash (at $14/sq ft). 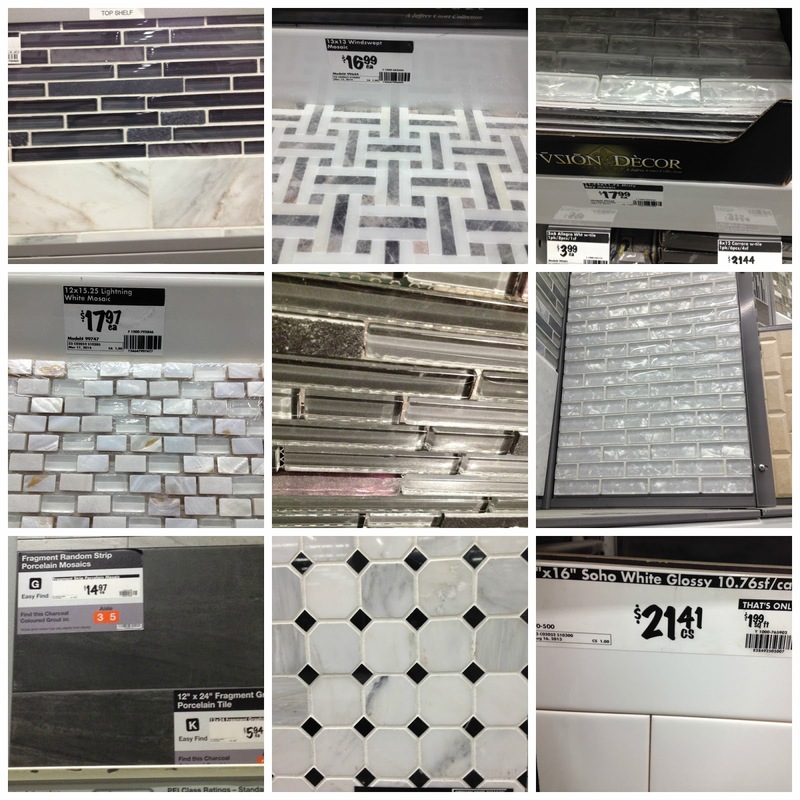 I've noticed that not all Home Depot stores have same tile selections, so it is worthwhile to shop around plus one needs to go around the tile area as not all tiles are presented in the same row (i.e. some special ones are in separate areas). Also, noticed some small disparity in prices between stores as there was a $1 dollar difference in price for stainless steel penny round between different stores. 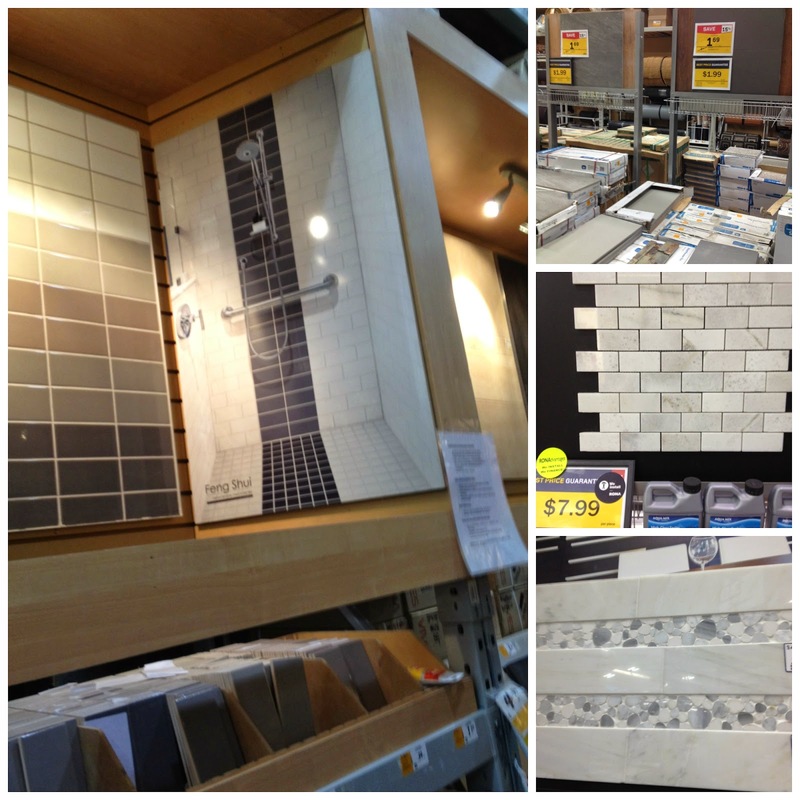 We have purchased 12x24 white glossy tiles for our master shower (at $2.25/sq ft). Since the purchase we have changed the size of the shower and I was left with quite a bit of extra tile which I decided to use in kids' shower as well. We had even more left overs which we then used in townhouse shower. From here we also purchased 18x18 marble carrarra tiles (at about $6.5/sq ft) for our master floor which actually got re-purposed for kids' bathroom floor. 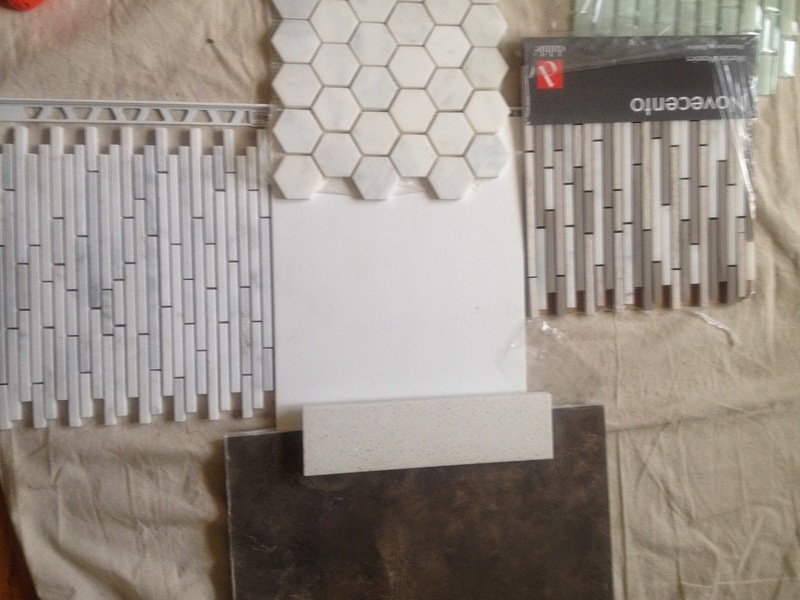 We ended up purchasing from The Tile Shoppe for our basement bathroom floor as well, long narrow tiles and similar mosaic that we used for shower floor (at about $3.5/sq ft both). I was eyeing black hexagon tiles (in photo below) for our laundry room floor but at $3.5/sq ft I needed something cheaper so decided to go with Rona's 12x24 tiles at $1.5/sq ft.
Nice marble and limestone choices that remind me of Saltillo Tiles even though not as much selection but at better price points. They give you samples on loan that you can return at no charge which helps in decision making. You cannot, however, return extra unused tiles. As far as I can tell they are located only in Mississauga. They are also pleasant to work with and depending on the amounts you want to buy, you can probably work out some kind of discount. 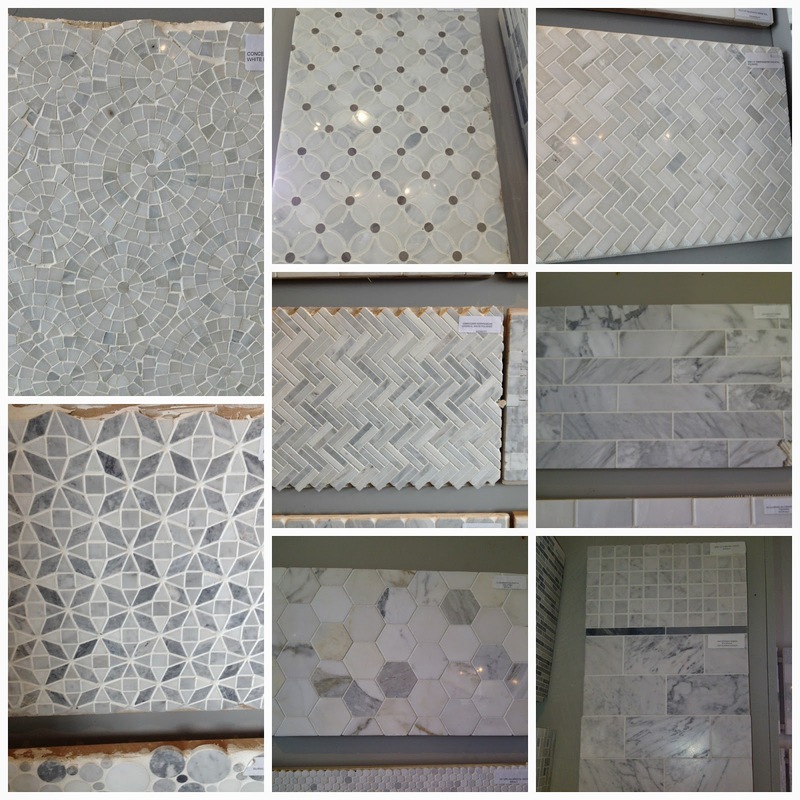 I wished I was able to select more this store, but we ended up only buying bianco carrarra hexagon tiles for our master shower floor (which I looooveee) at about $13/sq ft and some tiny marble mosaics (pictured below) for townhouse shower floor at about $10/sq ft. 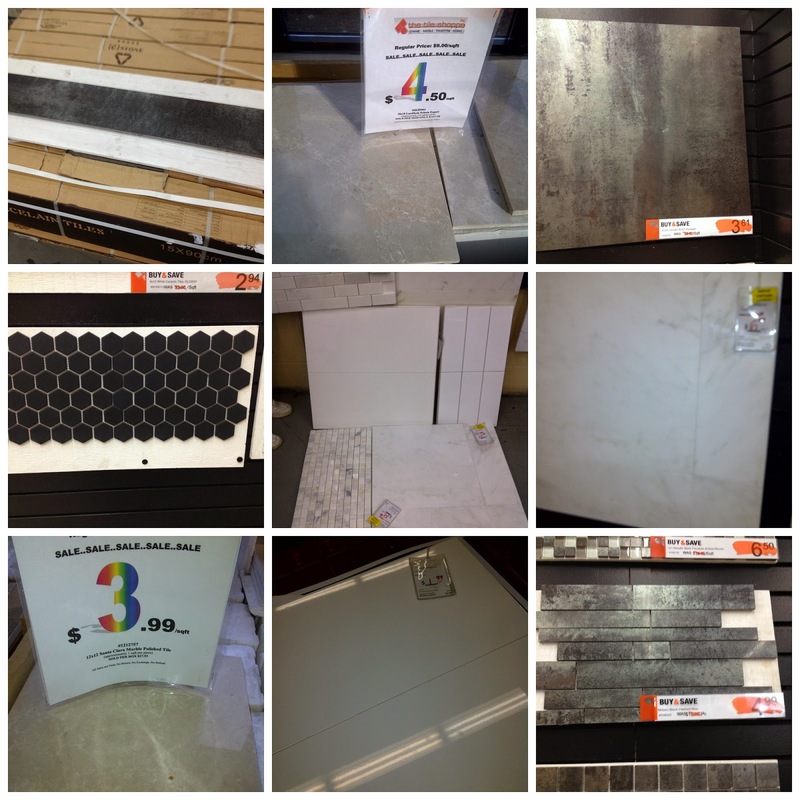 Similarly to Home Depot, there are some interesting choices and one is able to return unused tiles. We first purchased 18x18 gray (cement looking) porcelain tile for our laundry but upon advice of our contractor replaced it with 12x24 tile that looks the same (both at $1.5/sq ft). I've also noticed that some stores do not have the same sales. Similar points as for Rona & Home Depot above. I've had some images of tiles I've found here, but not sure where they are, I might add them later when I find them. We ended up purchasing white Moroccan mosaic tiles for laundry room back splash here at about $8/sq ft.
Saltillo Tiles came to my attention a few years back after following Sarah Richardson's adventures on HGTV. 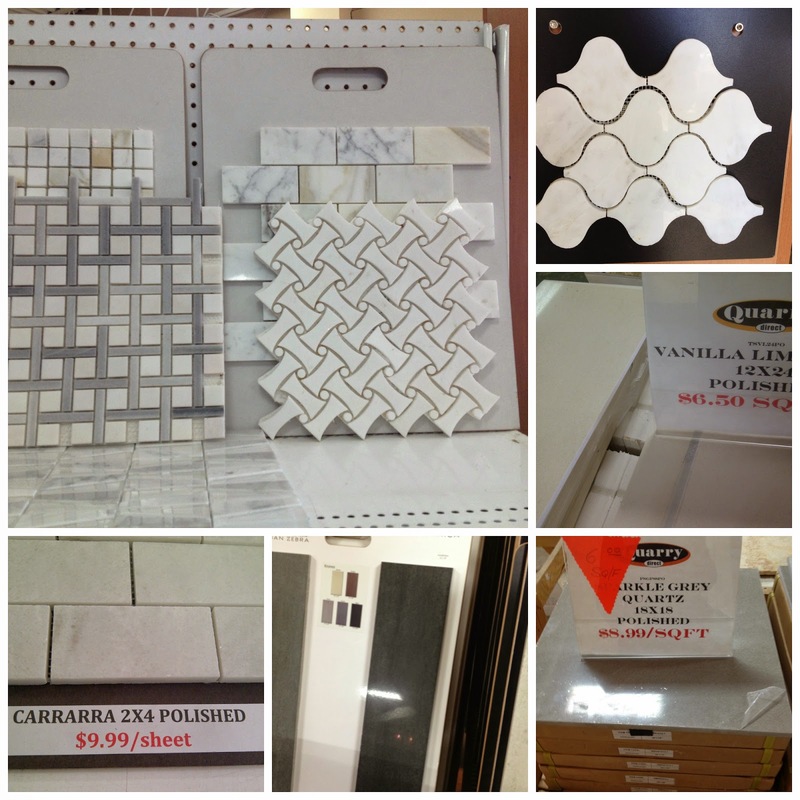 They have one of the greatest selections I've seen of marble tiles if one is ready to pay for them. While, personally, I can justify paying for a small showcase piece of tile that I cannot find anywhere else, there are number of tiles that they carry that one can find elsewhere (same or similar). For example, some of the marble hexagon mosaics, stainless steel penny rounds, etc where price difference is sometimes as much as $10-$15 dollars. That said, we managed to find a deal on tile we will use for fireplace surround at about $7/sq ft.
Tiles can be returned here but at 30% restocking fee (basically you might as well keep it). As I could ascertain they get a lot of business and it shows as I did not find their staff to be very welcoming. For some reason I did not find anything couple of years ago here and had impression that everything was very expensive. During the current renovation I've ventured again as I was searching high and low for penny round tiles and found nice selection and good price points for number of tiles. While I did not end up ordering anything (they typically order from Montreal so it takes a couple of days for stock to arrive), I really wanted to incorporate the dark blue penny round tile which did not end up working with color scheme so I had to pass it up. For illustration purposes, that penny round tile (same for white one) cost about $8/sq ft. It is typically located together with Taps Bath. While there are other stores like Olympia Tile and a few smaller stores around the city, I never found more than one or two things to really capture my attention. I've visited Olympia Tile this time around as well as my contractor also has quite a discount there, but even with that I did not find anything that would work. That is not to say that I would not be able to make something work if that place was my only option - they have some nice selections as well. Trying to decide between two strips of mosaic tiles for maser shower combination. One of left gives less contrast and more understated look while the one on the right ties all the colours better. Tile options and combinations for townhouse bath where we used scraps from our two other bath renovations and were buying additional tiles to ensure we had enough. It was important here to match it all so nothing would look like an afterthought.